When you're out on a windy hillside looking up into the night sky, it can get a little chilly. Stargazing is a collection of warm lambswool scarves with a geometric pattern that I developed as an offshoot from my Permutations project. 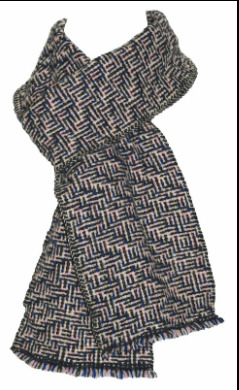 The scarves are handwoven in a contemporary style without a fringe, using supersoft lambswool spun in Scotland . Last remaining Stargazing scarves are available in the colour combinations shown below at £95 each - see How to Order for ordering and delivery information.